Udon is kind of noodle. 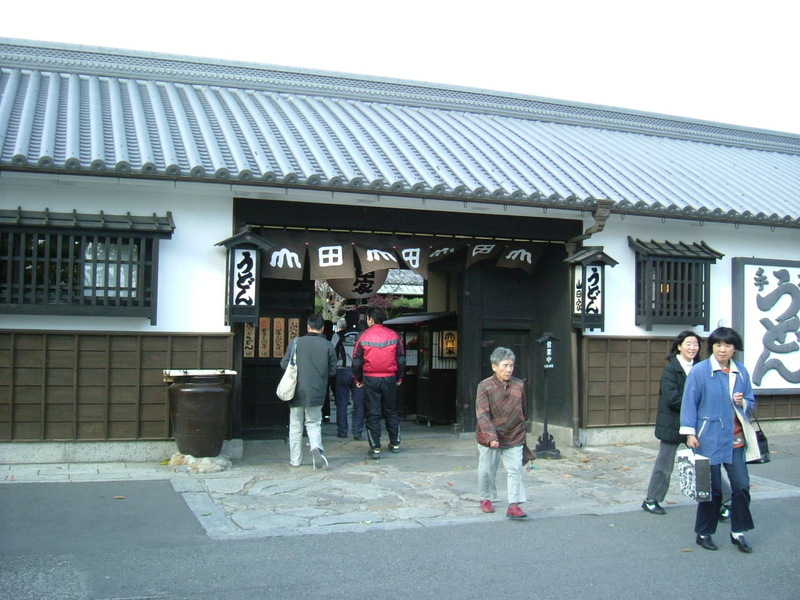 Kagawa prefecture, where Yakuri-ji Temple is located, is famous for its delicious Udon. Three of us were from Kagawa and knew many Udon restaurants of repute. We decided to go Udon restaurant-hopping. Enjoy the pictures! 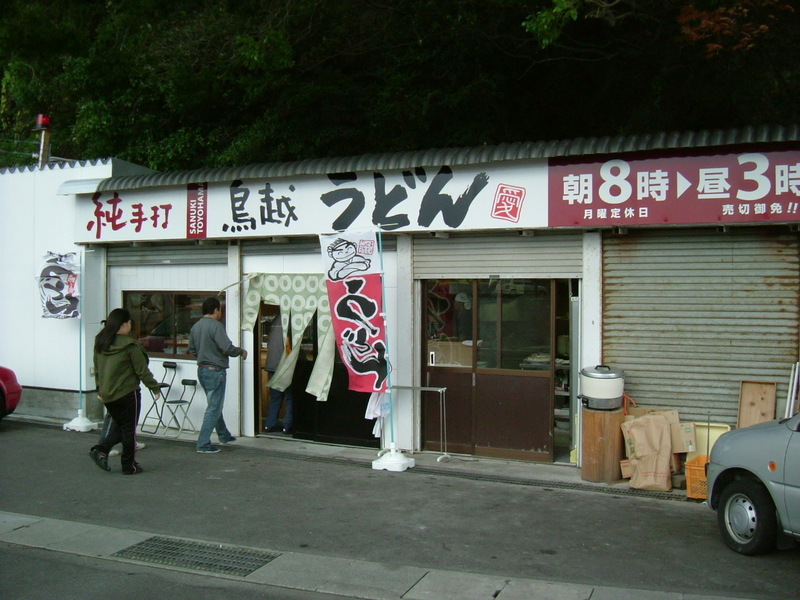 The Udon restaurant that we went to first was just beside the parking lot. 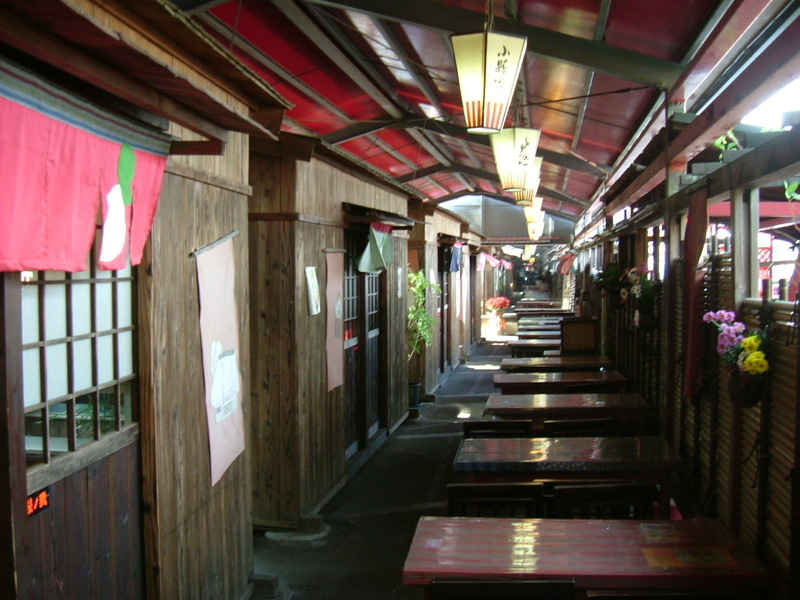 The restaurant was small and stood in obscurity beneath the steep slope of the hill. The price of Udon was cheap but delicious. As expected, we were in the midst of the Udon prefecture. 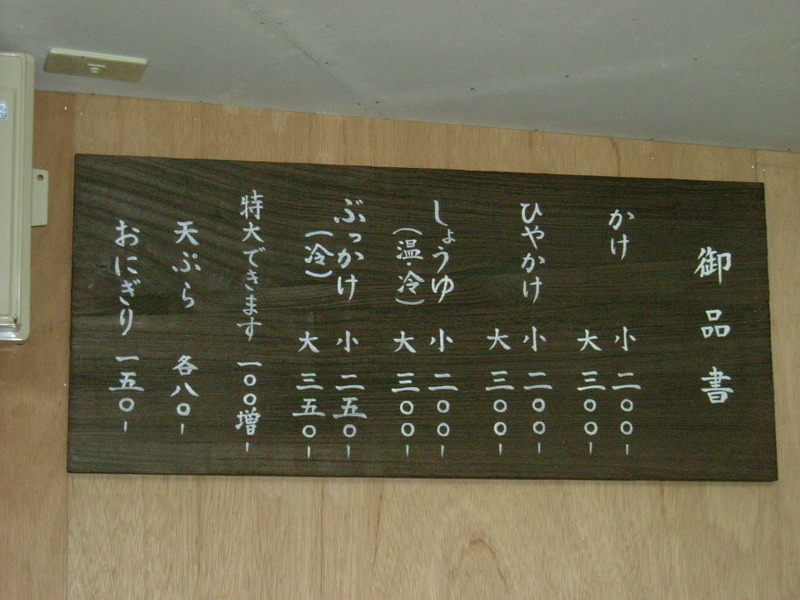 The 2nd picture is the menu. 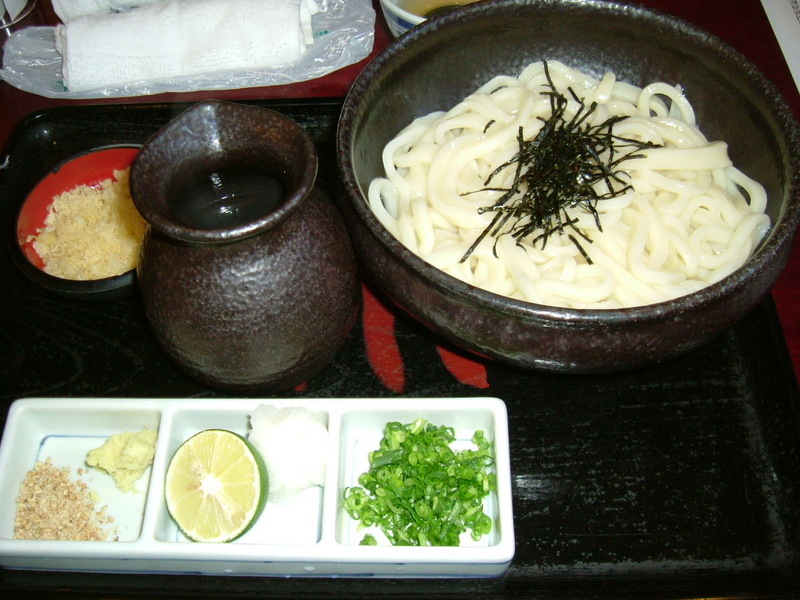 There are many Udon restaurants in Ehime prefecture where I live and I often go to some of them. I thought I knew Udon well, but it was the first time I had seen such a scene shown in the 3rd picture. 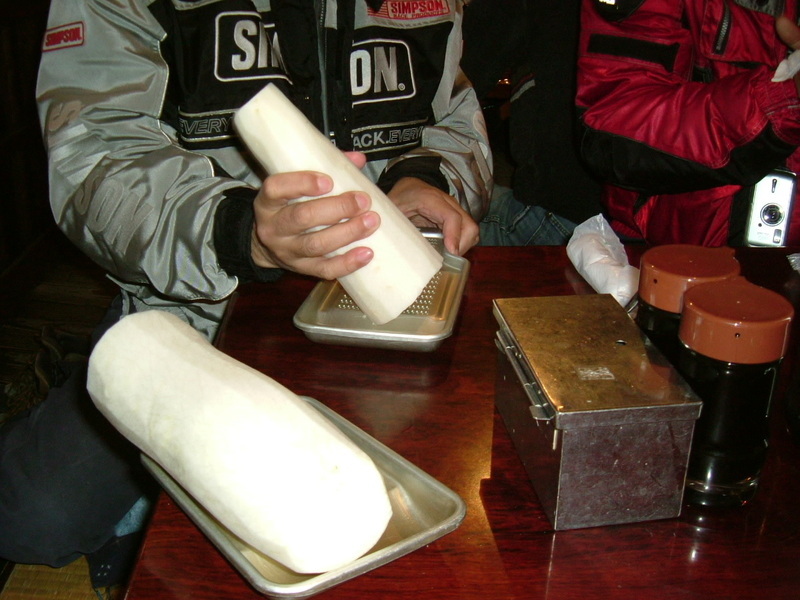 The thing that was delivered to our table first was two raw pieces of radish and two radish graters. We grated the radish waiting for our Udon. The 5th picture is the soy sauce Udon that I ordered. 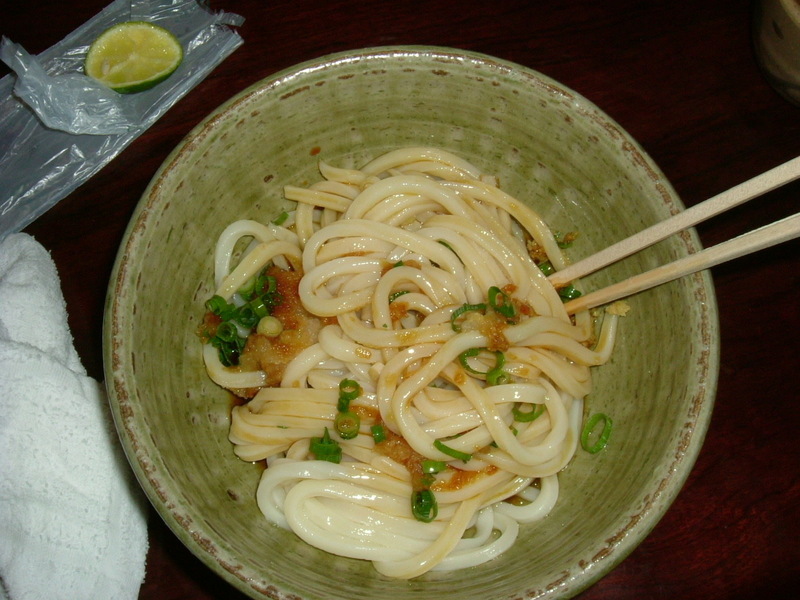 It was a very simple Udon that was doused in soy sauce. The next picture shows the outside of the room I used. 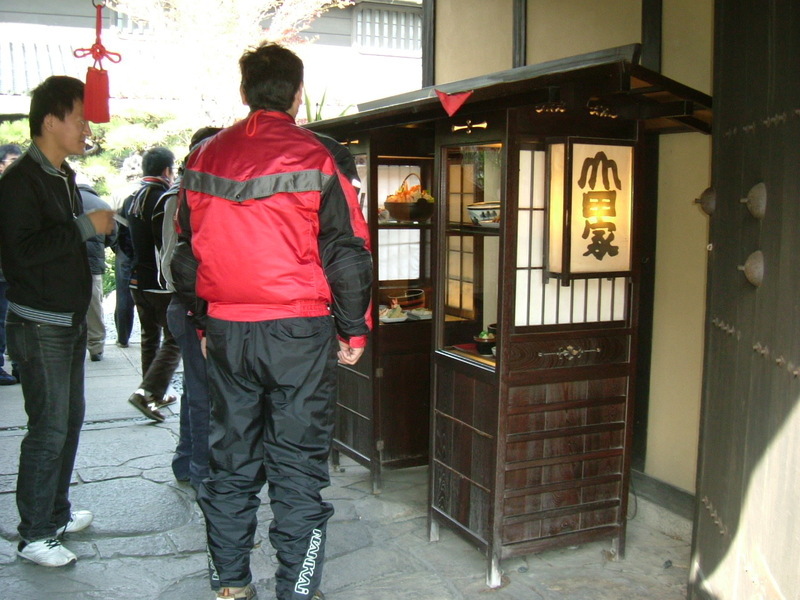 The last three pictures are the 3rd Udon restaurant we went to. Two months had passed since I got a new scooter, but the total mileage was only 650km on Nov. 18th. The manual of the scooter tells me not to rev over more than 5000 until the mileage reaches up to 1000km. It's for kind of warming-up the engine. I kept to this rule faithfully, but I wanted to rev more than 5000 so I went out for a one-day trip to add mileage and for a change. The destination was Yakuri-ji Temple, which was the 85th of the Shikoku 88 temple pilgrimage and was 170km away from my home. I enticed my friends to go with me and two of them got together. 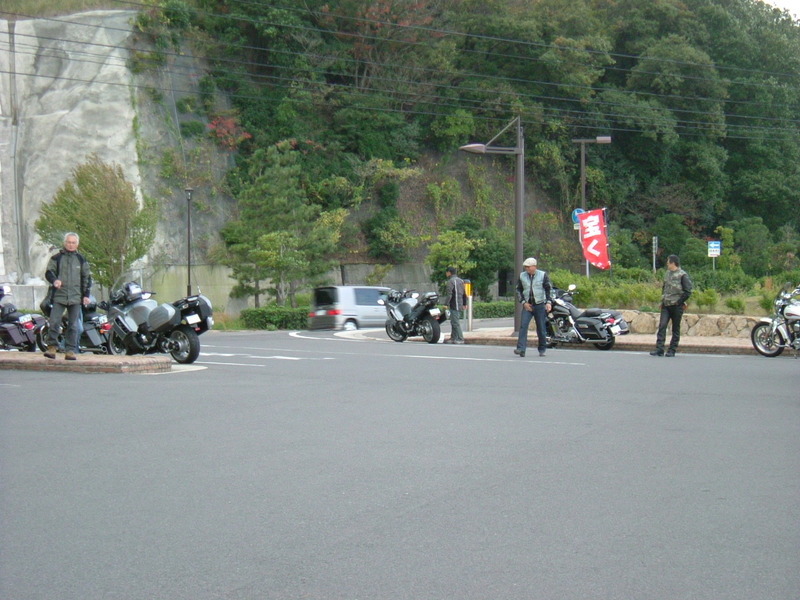 Another three riders joined us at Toyohama on the way to Yakuri-ji Temple. The pictures below were taken at Toyohama where we took a rest and had a late breakfast. At any rate I could see many kinds of motorcycles here and had fun. I'd like to have a BMW next. 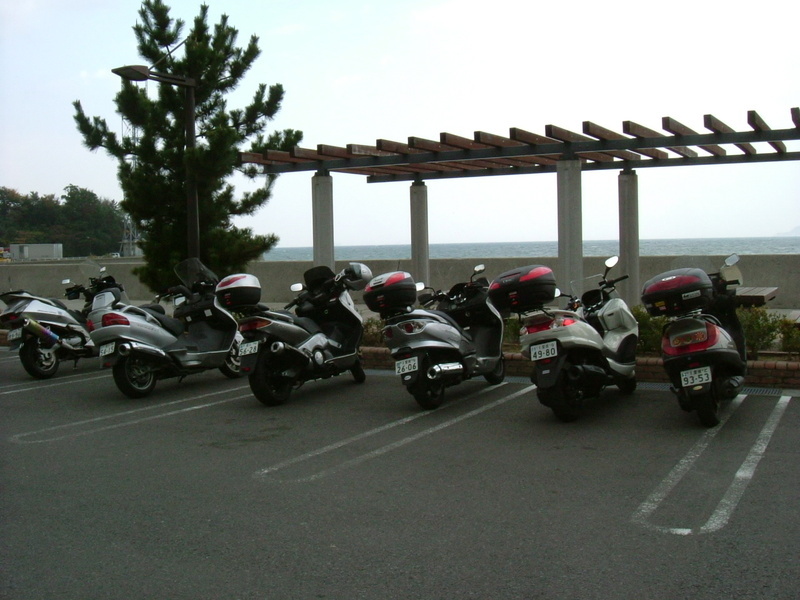 This picture shows our six scooters. Our ages were between 40 and 70. The scooter is very easy to ride on and suitable for older people. Just after we parked our scooters, a clutch of young men came in the parking lot. They seemed to be in their twenties. Their motorcycles were heavy and powerful. I used to have this type of motorcycle in my student days. 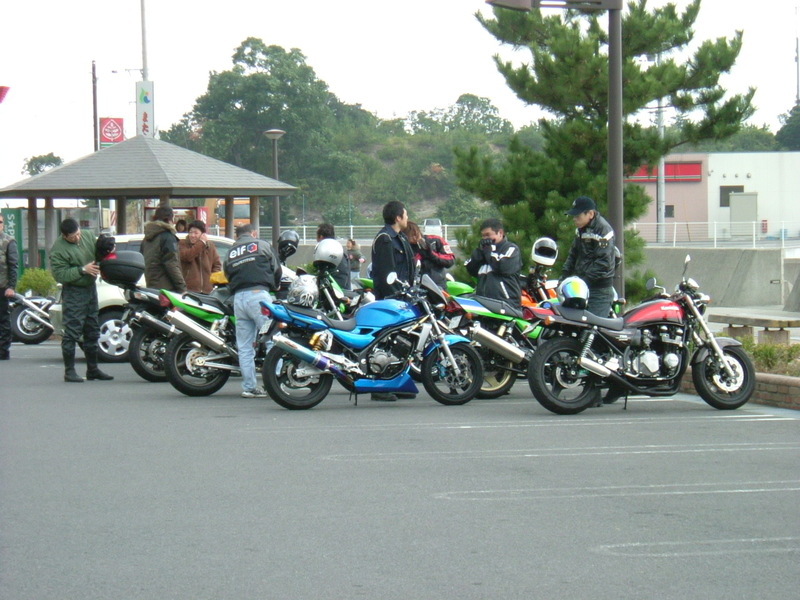 Ten minutes later, a group of more than 1000cc motorcycles came and parked between the young men and us. Some of them were Harleys. 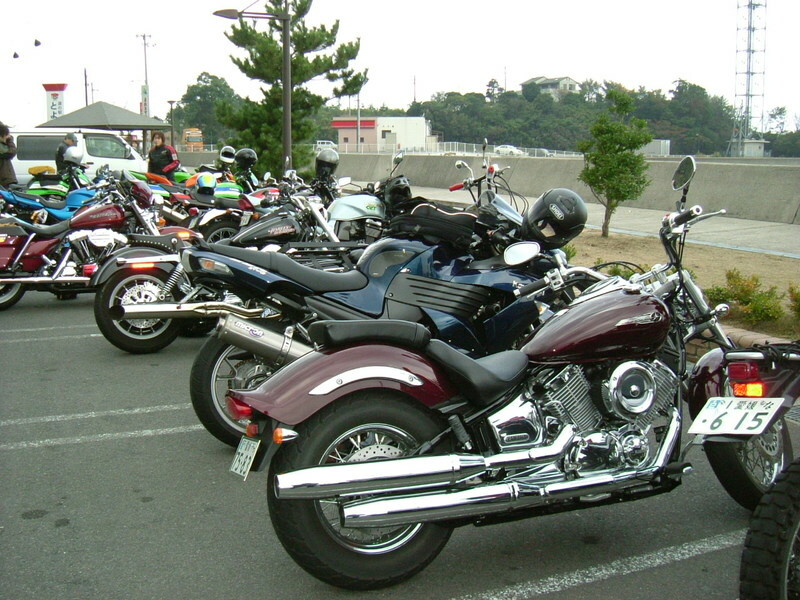 When I started, I found another group who had European motorcycles at the entrance of the parking lot. I had an e-mail from a Korean postgraduate student whom I met on the internet. 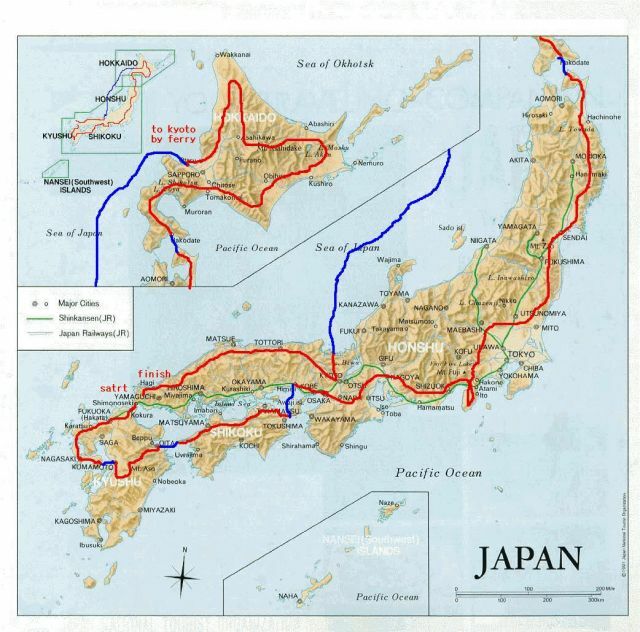 He is planning to enjoy riding a motorcycle across Japan for three months in 2008. I have always thought of riding in South Korea for these past two years, so he is just the opposite case to me. However he doesn't have enough information on Japan. When is the best season for riding in Japan? This was his first question. 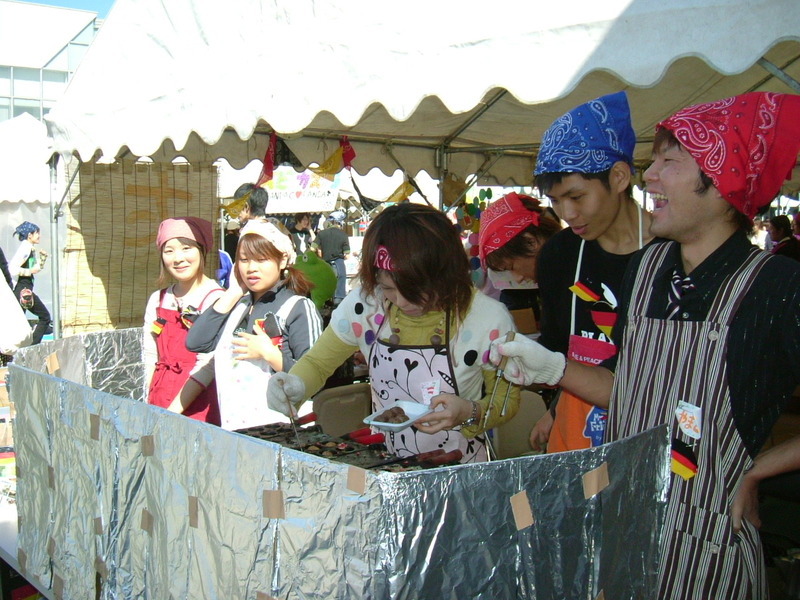 Japan is a small country as you know, but Japan has various climates in each area. I'm going to give him as much information as he needs....in Korean. This makes me better at using the Korean language and will help me travel by myself in South Korea at the same time. He showed me a map of his plan. I'm happy to know that my hometown, Matsuyama City, is located just on his route. I suggested he could stay one night in my house. If he doesn't mind, I'd like to ride my scooter with him for a few hours. I really think that the internet is wonderful. He seems to have some friends in Japan using the social network service. I think that he has read my blog that contained my severe remarks against South Korea, but he puts forward an idea: Let's put aside the relationship between both countries and let's go together face to face as a single individual. It's OK and great! I'm looking forward to seeing him. 마츠야마시와 평택시는 자매 도시이니까, 평택시에 가면 손에 들어갈지도 모릅니다만, 보내도 주어요. 공항등에서 무료로 입수할 수 있을테니다. 세토나이카이는　한려해상국립공원를 닮아 있는 것 같습니다. 세토대교는 부디 달려 보세요.에히메현 남부의 해안선도 예쁩니다. 일본은 작은 나라입니다만, 변화가 풍부하고 있습니다. 큐슈와 홋카이도의 투어링이라면 여러가지 어드바이스 할 수 있습니다. 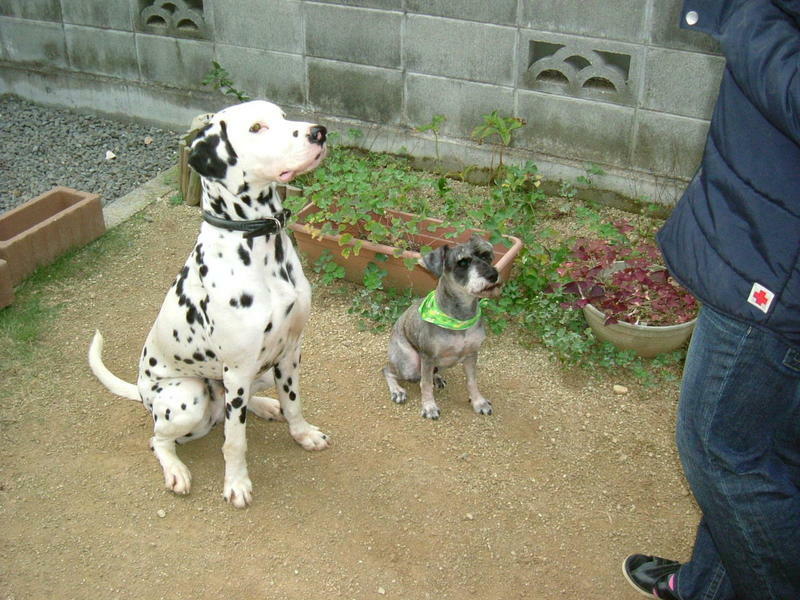 There is an NPO in my city that helps us find a new owner of a dog that is in difficult circumstances such as unwanted baby dogs, abandoned dogs, retired guide dogs for visually challenged people and so on. Guide dogs are tightly bonded with their owner and I'm sure all the owners would want to take care of their dogs until the last minute but they can't do it because of their physical problem. 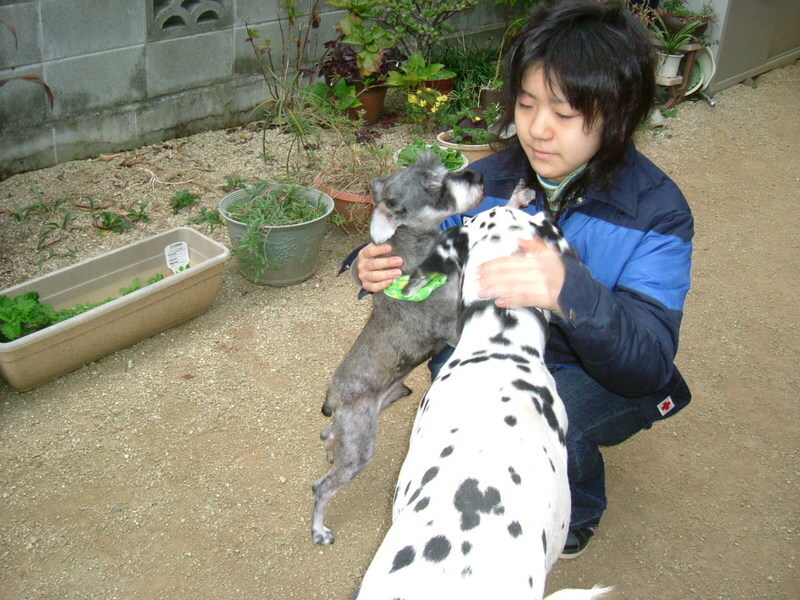 These dogs will come to be under the care of volunteers. They'll spend the terminal period of their life with these volunteers. I didn't know that, but a meddlesome old woman had asked the NPO to find Gonbei's new owner without our permission. 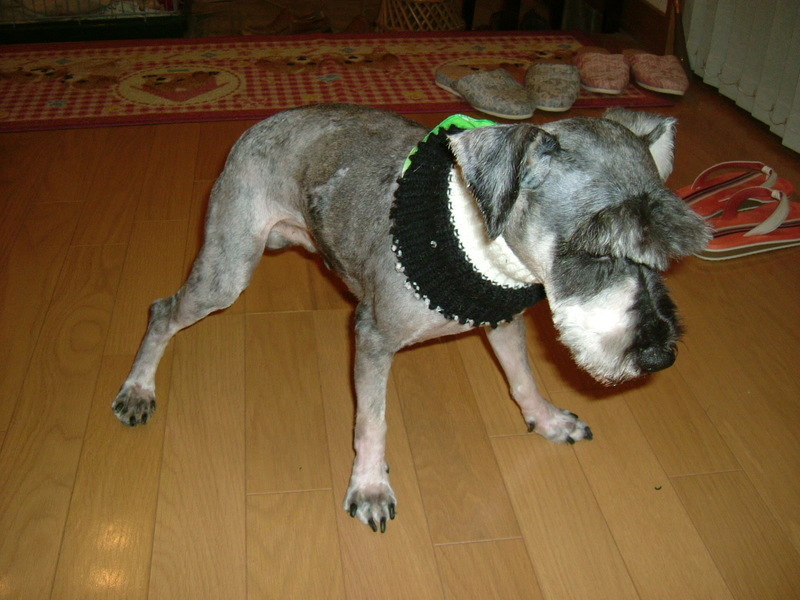 The other day an NPO member called us and told us that they found a suitable person for Gonbei who already has a Standard Schnauzer and wants to have a Miniature Schnauzer. Gonbei seems to have become attached to A and obeys A's simple orders such as "Stay", "Sit" and "House". However, all of my family members are out in the daytime and Gonbei might feel lonely. We thought like this and decided to leave him to the care of the new owner. I'm going to show you a school activity today. The other day a dozen junior high school students visited my hospital to see how it is inside the hospital. Some of them were eager to become a medical doctor, some wanted to be a nurse or a pharmacist. Boys and girls think of their future vaguely when they become a junior high school student and have to choose which way to go next. In order to help them find out the chance is given to them to see or experience a lot of occupations and work places. My hospital was approached as the medical service company. When I was exchanging the gastrostomy tube of a patient who had been in a vegetative state for more than 5 years, the head nurse came to me and asked me to explain the condition of the patient and what I was going to do to the students. He had got the consent of the patient's family in advance. The picture shows the scene. All the students didn't know what the vegetative state was. It looked like they were shook up to see the patient. They were also showed the operation room, a few X-ray related rooms, the pharmaceutical facilities, rehabilitation department, , , . I thought this day would be strongly imprinted on their minds. My brother, a journalist, was travelling in France for his vacation. 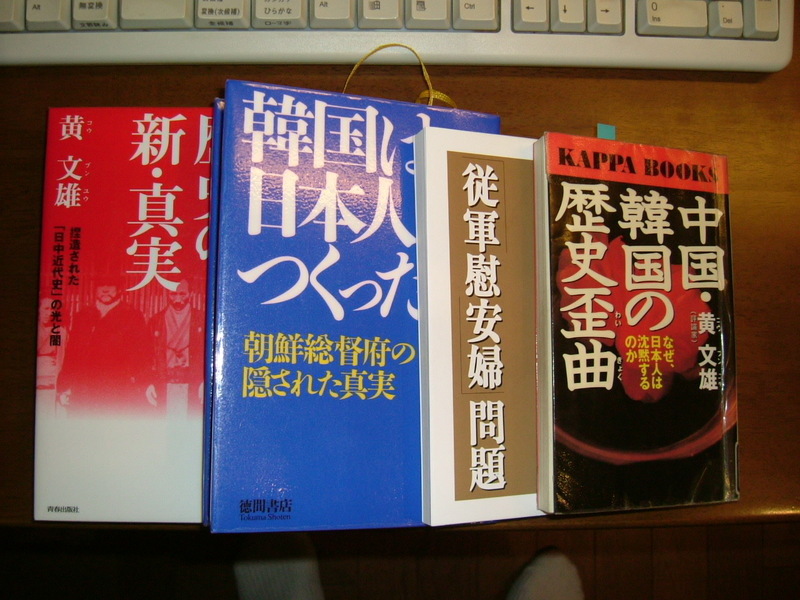 The picture shows the map and pamphlets that are written in Korean. I asked him to bring them back when he was just about to fly to Paris. I'd like to get anything official that is written in Korean. Anything was OK, for example maps, pamphlets, time schedule sheets for flights, trains or buses, information on hotels, theaters, museums, , , and so on. These are for free and my brother wouldn't feel any pain to collect them. If he couldn't find them, it was OK. Anyway, I sometimes look at this map of Paris over a glass of brandy. I've never been to France, but my imagination takes me to Paris. Besides it is good for learning Korean. Why Paris? It's because one of my daughters is learning French and I hope that my family can go skiing in Chamonix plus I'd like to get on the TGV and enjoy travelling under the Channel. Her French would help us enjoy travelling and skiing in Chamonix. I'm planning to visit Vancouver for skiing next March. I've been to Whistler 5 or 6 times, but I've never been to Europe. I'm really keen to visit some countries in Europe someday. 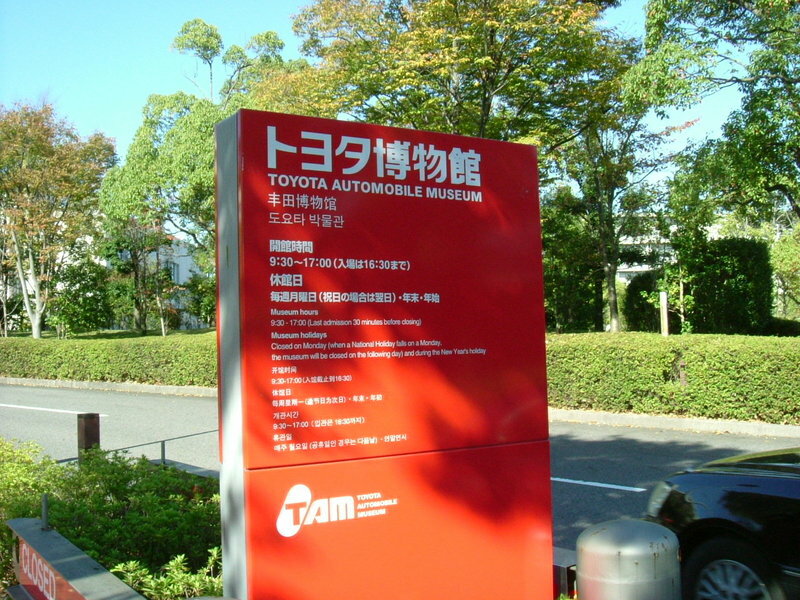 I called in at the Toyota Museum on the way to Nagoya Station. Toyota is that Toyota that is one of the biggest companies in the world. 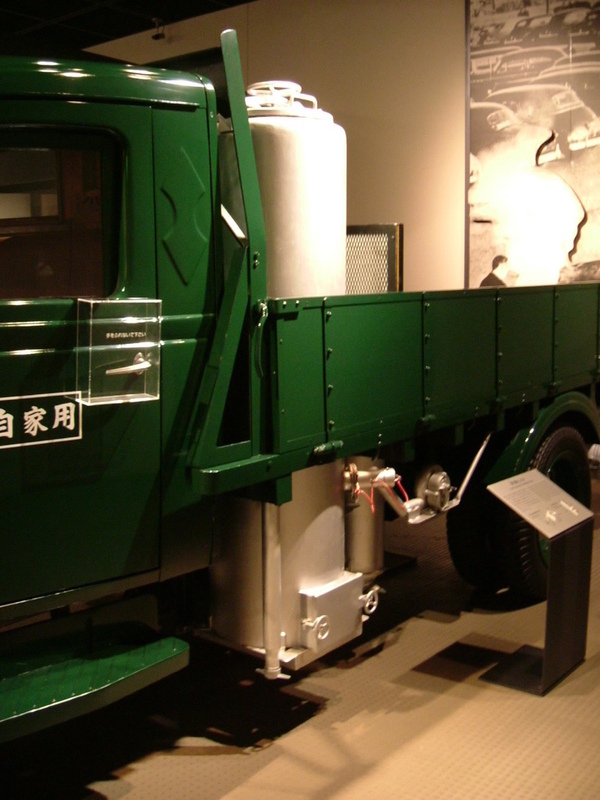 You can understand the history of automobiles and the wisdom of human beings there. I saw a Ford Model T that is known as the world's first genuinely mass-produced car. The first domestically built automobile was exhibited at the entrance. This car must be an achievement of Toyota and also the starting point of Toyota. I let my mind drift back over the early 20th century. All the Japanese were struggling not to be left behind by the developed countries in those days. Consequently present-day Japan exists now. I sometimes feel that present-day Japan might be inferior to that of 100 years ago in many ways. 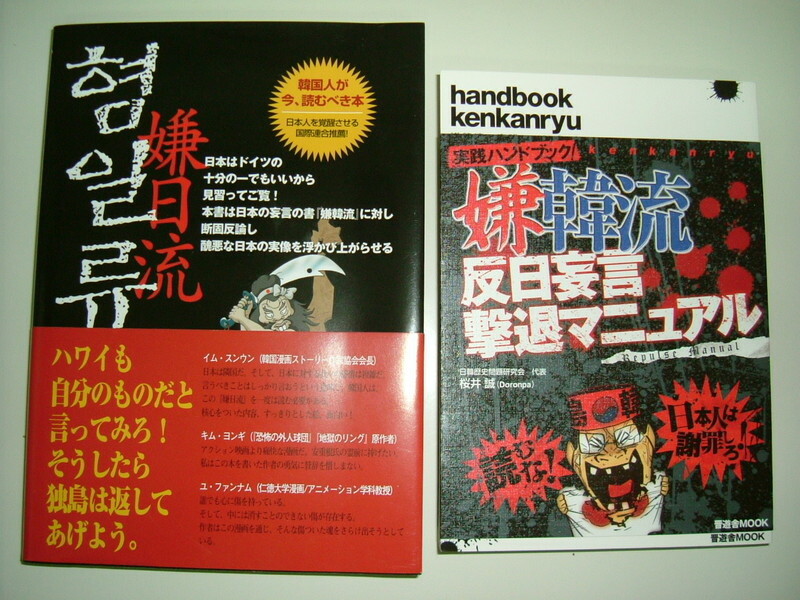 Present-day Japanese, of course, including me, have been living in secure and comfortable circumstances for a long time and became blind to the incidents of the world. Japan has no religious confrontation with any other country and keeps good relationships with all countries except China and both Koreas. I think that Japan must work for world peace from now on because Japan has enough power and modesty to do so. While I was thinking that way I found the first car that came to my house about 40 years ago. I remember my father, who was younger than me at the equivalent time, was delighted to be able to polish the car. I'm thinking that I'll take my parents there. 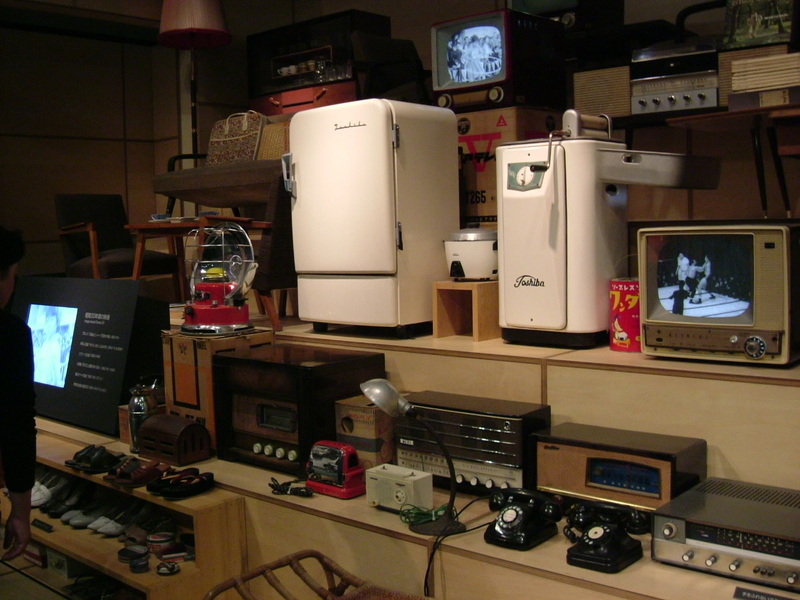 The daily necessities in Showa era (30-50 years ago). 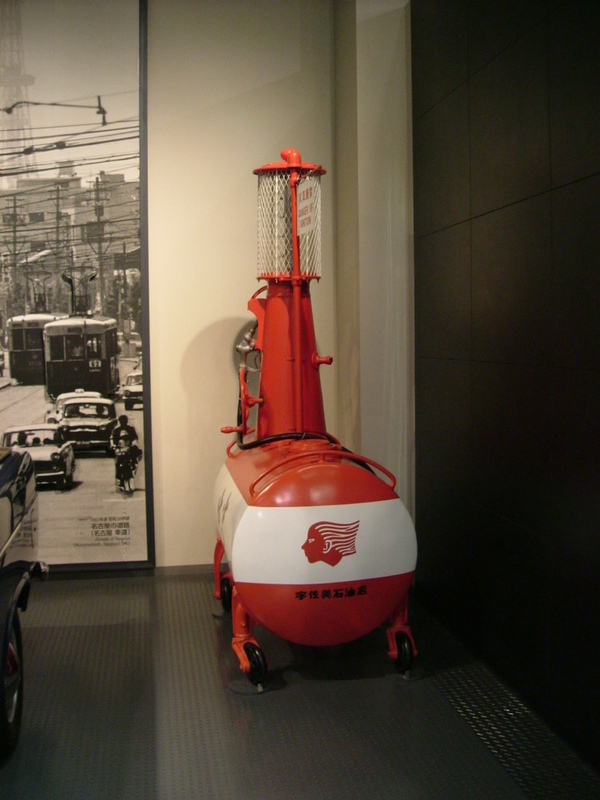 It's a portable gas station that supplies gasoline to automobiles, but it has already disappeared. 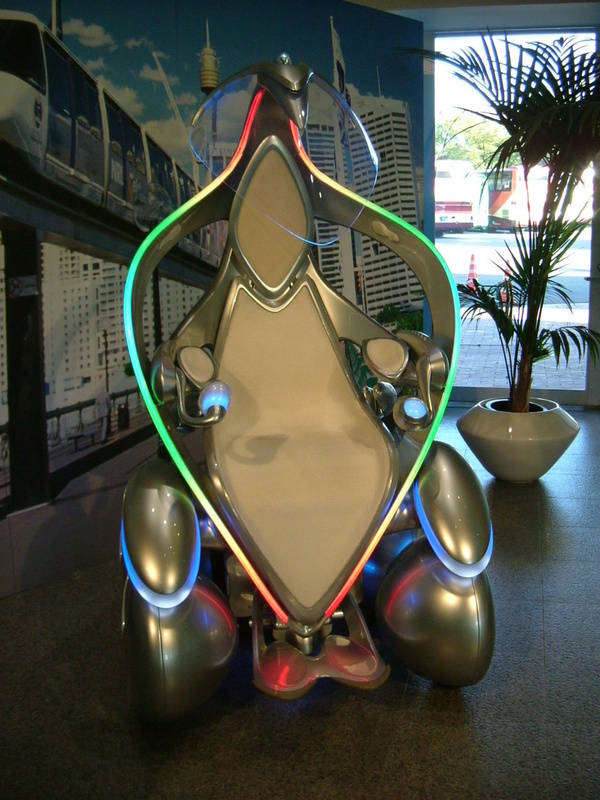 This picture shows a kind of car for single use. This car was demonstrated at the latest motor show in Tokyo. I stopped by Nagoya Castle that I had wanted to see for a long time. 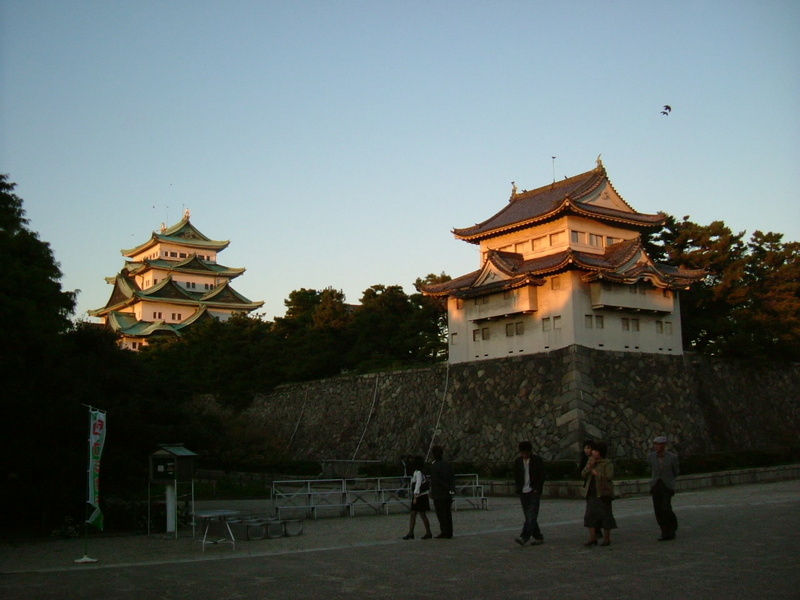 This castle is famous as a symbol of Nagoya City. There's a beautiful and magnificent castle in my hometown and I wanted to compare them. You can see the picture of Matsuyama Castle which is in my hometown. 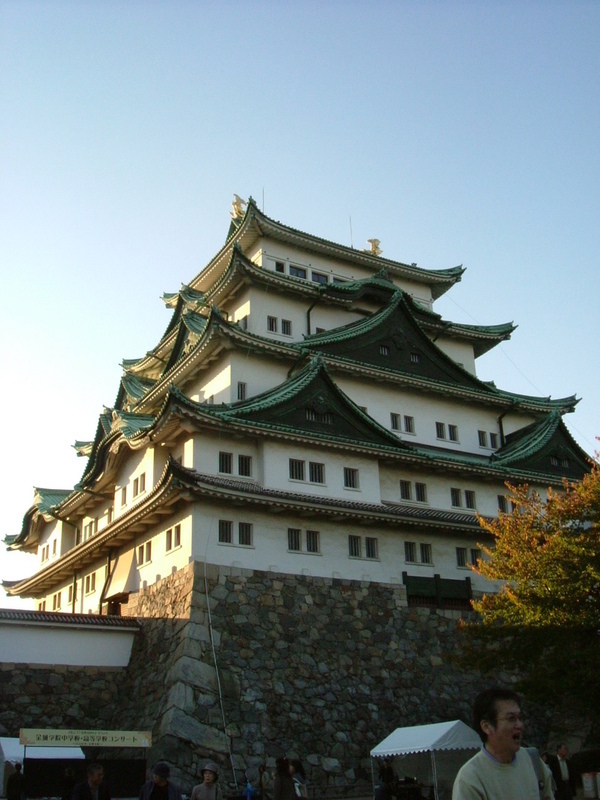 Japanese castles are constructed for Samurai's daily life and protection against opponents once the fight has started. There are many devices to fight off the invaders. On the other hand, castles have kitchens, wells, vault toilets, archives, storerooms for food and many other necessities. We can see how the medieval life was when we walk around in the castle. I was expecting that kind of thing, but I was disappointed to visit Nagoya Castle. I didn't feel any nostalgia that many people were actually living here until 150 years ago. I couldn't smell the medieval air of Japan. The castle was made of concrete and, to my surprise, it had elevators in it. It was just a modern building that has a medieval castle's appearance. The inside was a museum of medieval life; streets and shops were recreated and exhibited there. It was nonsense to me. I just wanted to see the castle. I arrived at Nagoya station at about six o'clock on Nov. 3rd. I got on the subway to my daughter's apartment. I had two hours to go until the opening of the festival and could take a nap in her room. Have you ever seen the magnetic levitated train? We call it the "Linear Motor Car". Test runs of linear motor trains are currently under way. 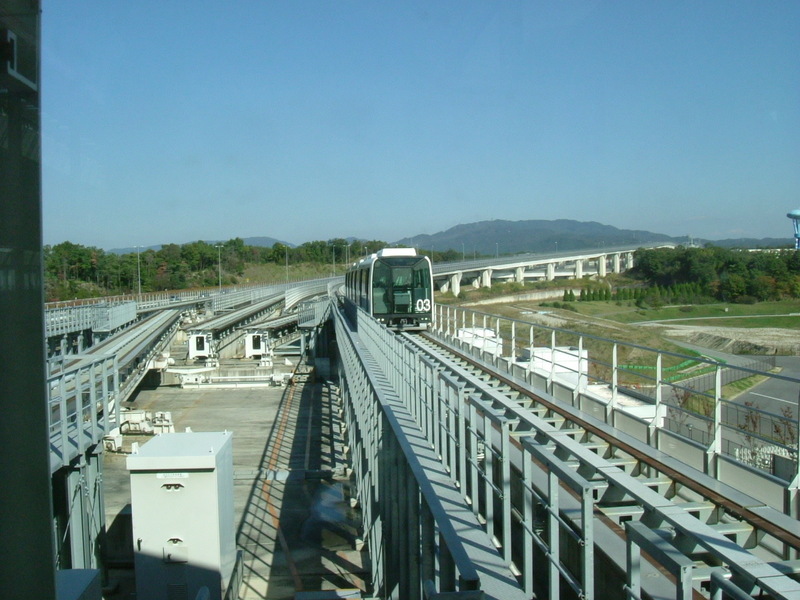 Linear motor trains will connect Osaka and Tokyo in about one hour, with a maximum speed of 500 kilometers per hour in the not so distant future. 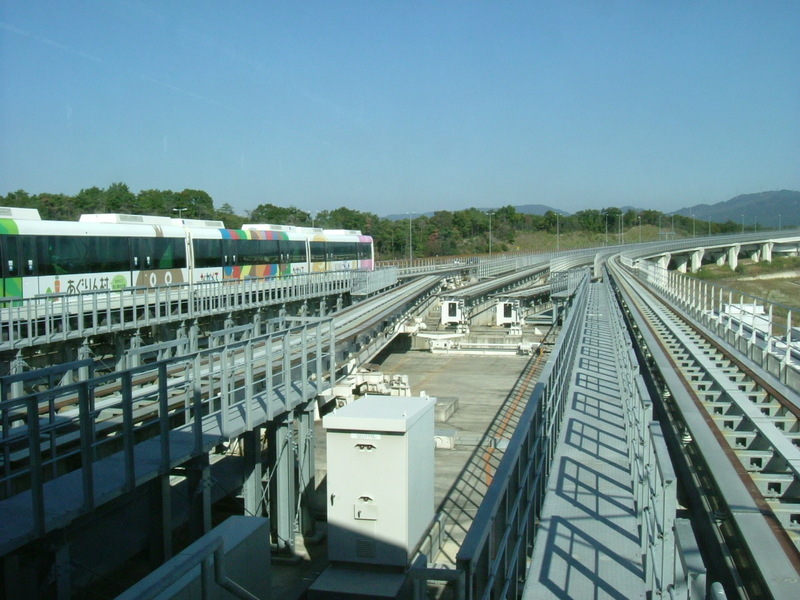 The first commercial linear motor line is in Nagoya City and my daughter uses it every day for commuting. The first two pictures show the train. 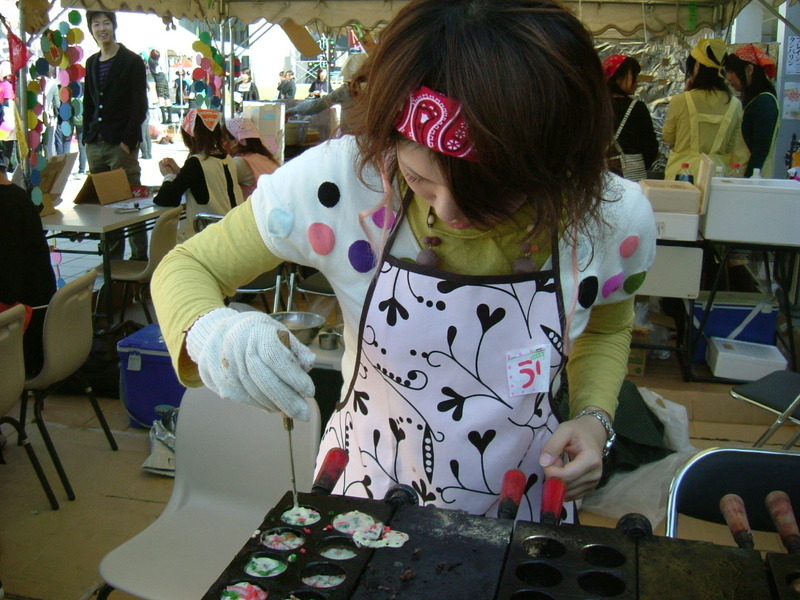 The next two show my daughter making octopus dumplings at her class stall. 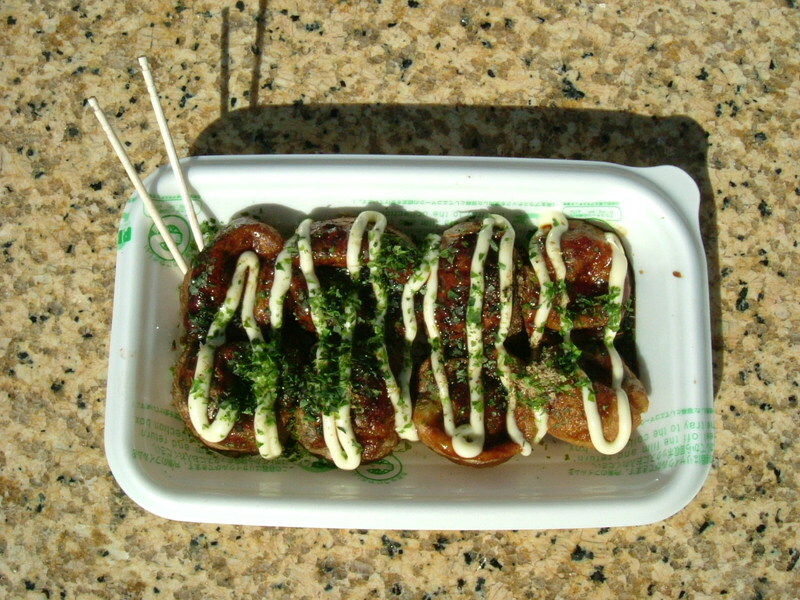 The last is the octopus dumplings called "Takoyaki" which are very popular in Japan. They were delicious. I could walk around the campus and see a few facilities and bulletin boards. The best thing I could do was that I had the chance to talk with her friends. I could understand the atmosphere of the university and it made me feel happy. This time last year, I hoped that she would get into the local national university and I thought it was enough, but she didn't think so. She wanted to try a higher level of university and succeeded. 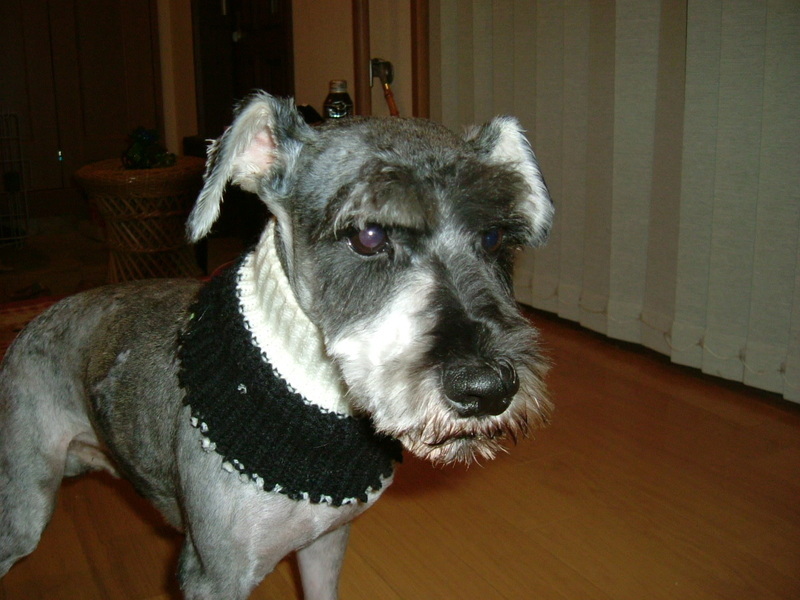 I was afraid that she would have many dificulties away from home, but such a concern proved unfounded. My second daughter is living in Nagoya city. I was wondering which was the best way between an airplane, train or bus to visit her apartment, because the University Festival, which she belongs to, will be held on Nov. 2nd-4th and I wanted to see it. The airplane would cost me about 400 US$ for the round trip. Likewise, the train 300 US$ and the bus 180 US$. In comparing these fees the bus service seems to be the best. On the other hand, from the point of view of required time, the airplane is best and the bus seems to be worst. It takes only an hour and a half to fly between Matsuyama and Nagoya, but the bus needs 10 hours. However the number of flights is small and if I use the airplane I would arrive at her campus at 10 o'clock and leave there at 4 o'clock in the evening, that is to say, the time that I can stay on the campus would be only 6 hours. The bus starts here at 7 in the evening and arrives at Nagoya station at 6 in the morning. For the return it starts at 11 at night from Nagoya station and arrives in Matsuyama City at 9 in the morning. It takes a longer time than the plane, but I can stay longer in Nagoya. After all I decided to use the bus. It was the first time in about 15 years to get on a long-distance night bus. When I used it last time, a neighbor passenger was drunk and snored loudly and besides he leaned against me. It was extremely uncomfortable and this made me keep away from the night bus for a long time. I found by chance a brochure of the long-distance bus service. The seat was for single use and could be reclined a long way. Furthermore the bus had a lavatory in it. I thought it was wonderful and had completely changed from the bus that I had been on before. This brochure made me decide to use the bus this time. The other day I tried Korean broiled meat at a mama-and-papa restaurant that is near my office. This restaurant doesn't look good and I didn't want to go there, but I heard that they serve very good dishes and I decided to go there. As for Korean cuisine, I guess the king of it would be broiled meat. There are many broiled meat restaurants in Japan too and I thought there's not so much difference between Japanese and Korean roasted meat. 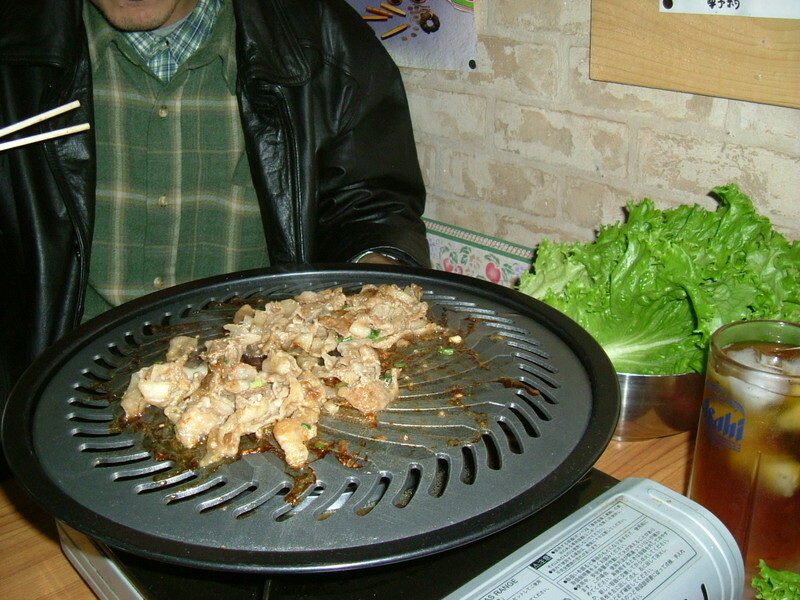 The picture shows the Korean style grilling. The meat has been immersed in basting for a couple of days before serving. I ate grilled meat in leaves just like a wrapping. The green leaves in the picture are for wrapping hot meat. It was really delicious. 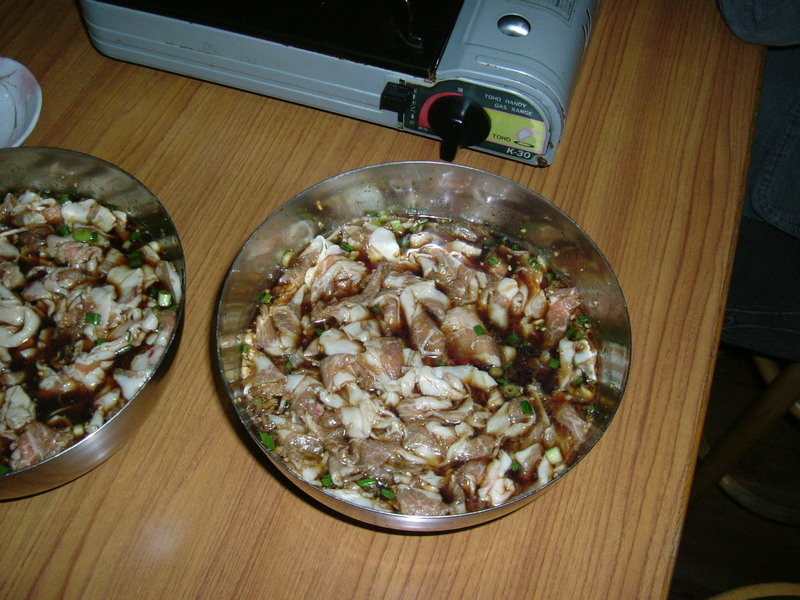 Soy sauce is often used in Japanese and Korean dishes. It may be the reason why I like Korean dishes. Today was my day! 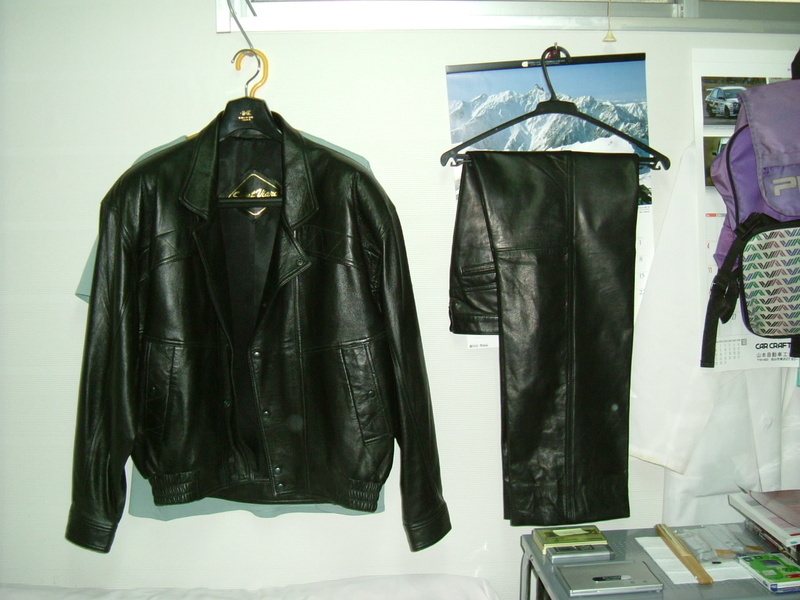 I got the leathers for motorcycle riding from my boss. When I went downstairs to OPD this morning, my boss came close to me and said that he had a suit of leathers for riding and he wasn't going to put it on. He wanted me to put it on because it was almost new and too expensive to throw away. I was so surprised! I didn't know that he had ridden a motorcycle long ago. The picture shows it hanging on the wall of my room. Japanese medical practitioners' law requires that hospitals must preserve the records of treatment of all the patients for at least 5 years. The bigger the hospital is, the more enormous the store space needed. Some big hospitals adopt the microfilm system for the preservation of documents and films so that they can save space. However, my hospital doesn't. Besides, we preserve all the documents for more than 20 years. Some X-ray films stick to each other and some documents are moldy and smeary. It might be of no use to preserve them for such a long time, but anyway my boss didn't throw away the records for more than 20 years. A few nurses and an X-ray technician went into one of the store rooms to clean up the room and allow fresh air into the room. The room air smelled stale. At that time they found a bat hunched over on the floor. He or she didn't move a bit. They took the bat back to the nursing station and looked after it. They were afraid that the bat was suffering from dehydration or hypoglycemia and fed the bat with a 10% glucose fluid from a dropper. 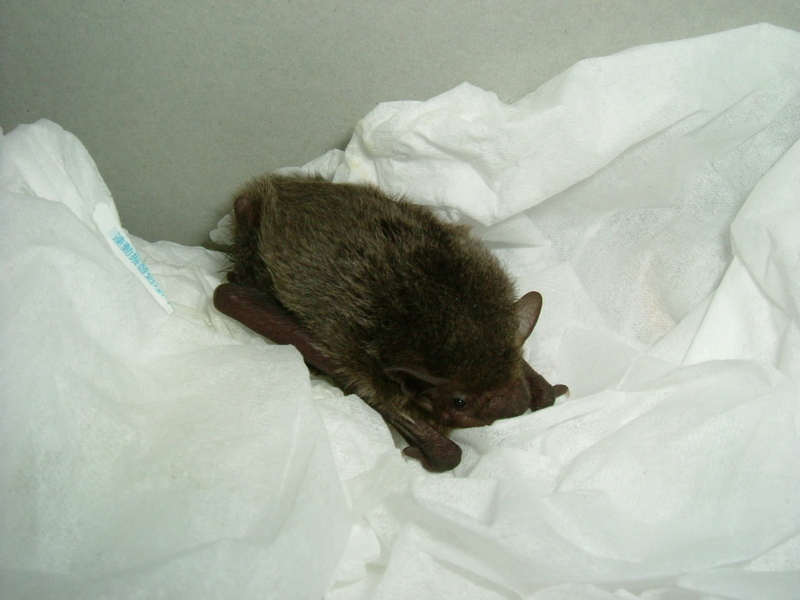 A day later the bat seemed to have recovered and began to fly in the room and was released outside at midnight. The nurses were great! 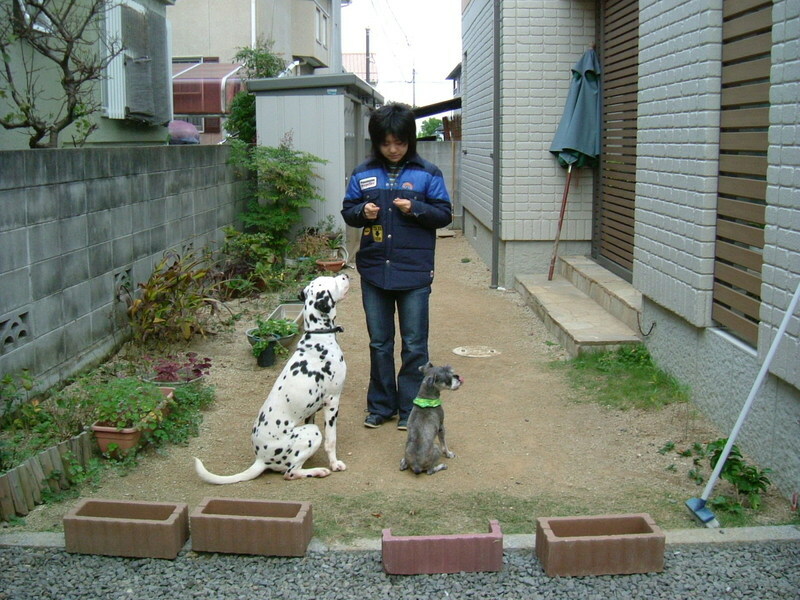 We have a 3-year-old Dalmatian, Mocha, now and hope that someone keeps Gonbei. Some people called me after seeing our signboard to inform the former owner where he is now, but the dog that they were searching for wasn't Gonbei. We had no choice and decided to keep it for some time until someone shows up who wants to have it. There is an NPO in this city that helps people find foster parents for cats and dogs. 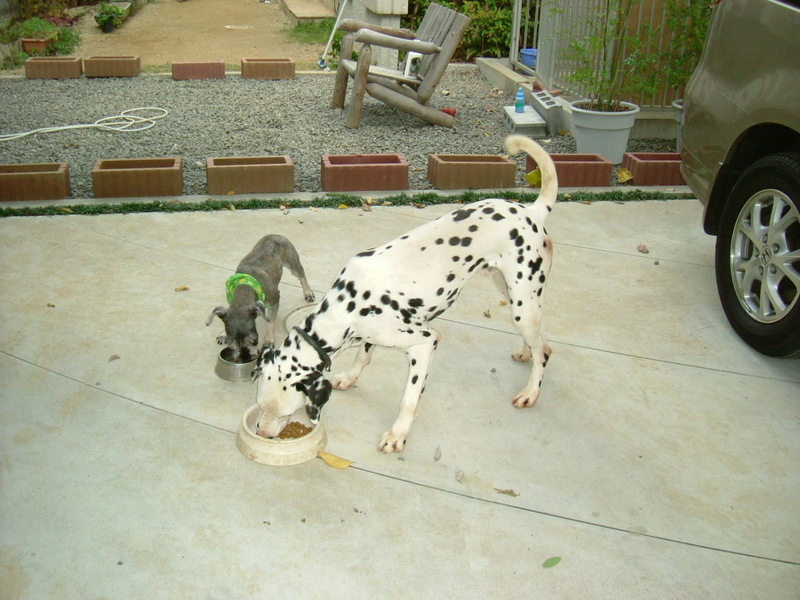 A checked their website and found that they required a medical checkup for cats and dogs before joining their website. Besides, Gonbei looks very dirty. 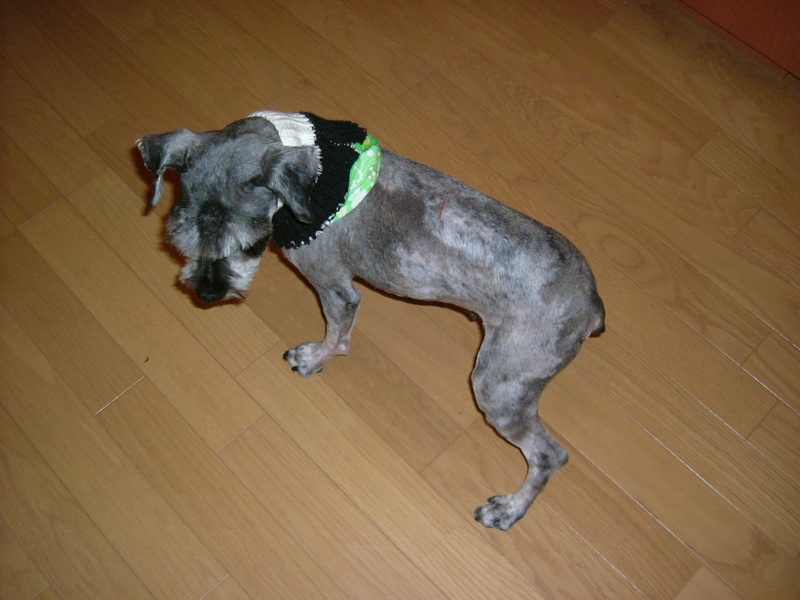 We took him to the pet's shampoo shop at first. 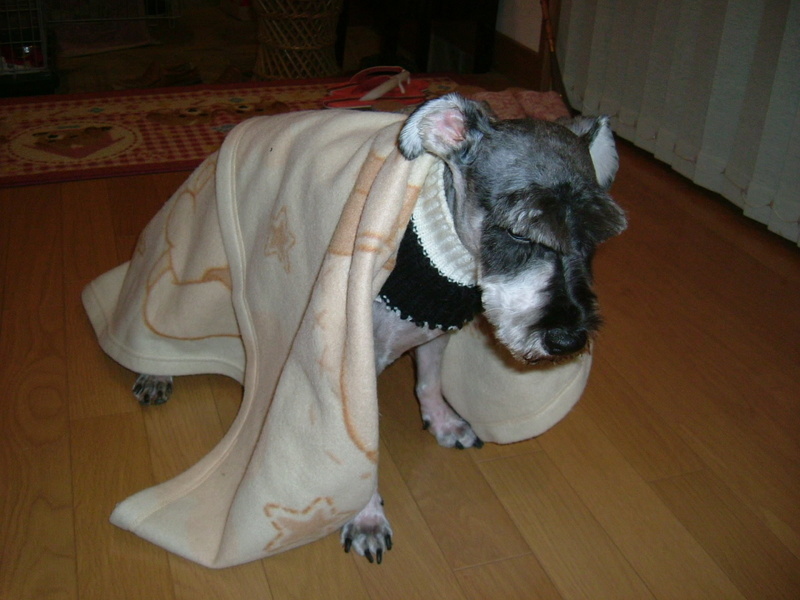 The trimmer said Gonbei was a Schnauzer, not a Miniature Schnauzer and his hair was extremely dirty and got caked with mud, so she couldn't shampoo it. 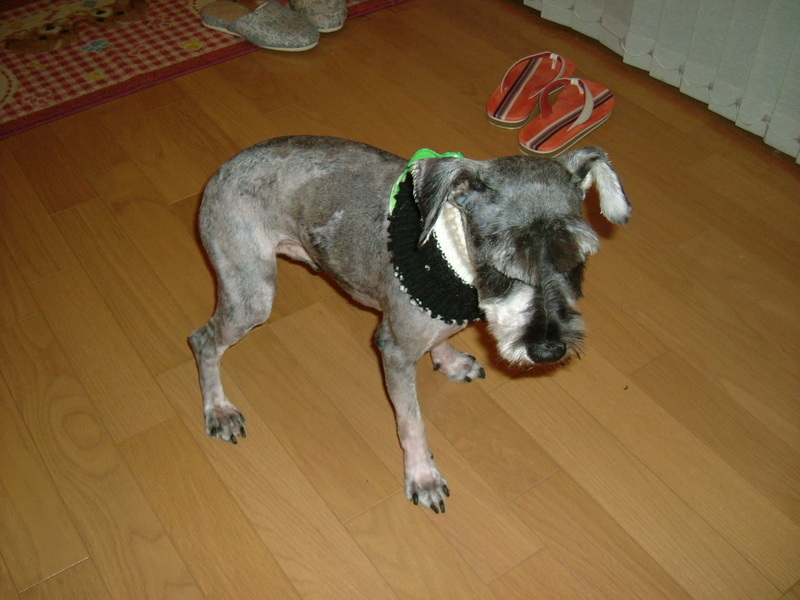 At last Gonbei was shaved over his whole body. 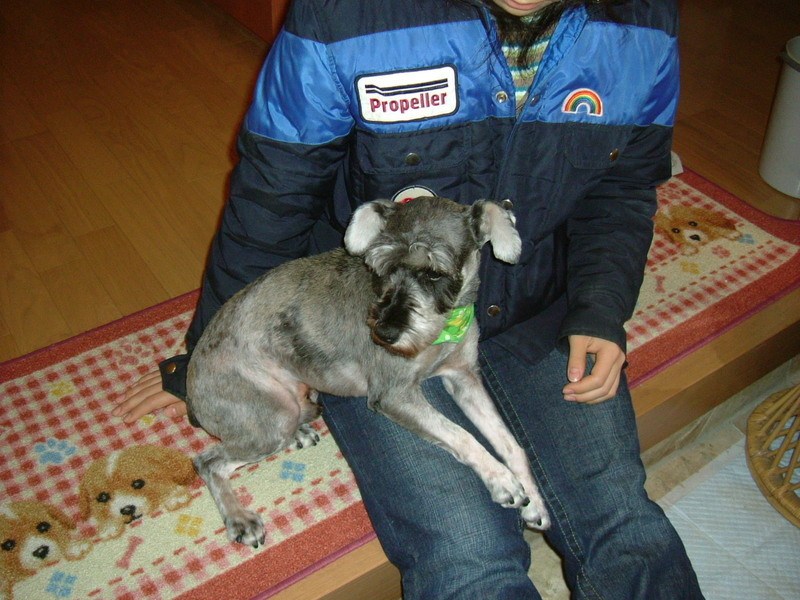 You can see his present status in the pictures below. We are going to visit the vet who usually checks Mocha this weekend and have Gonbei checked. I'm so sorry that my pocket money has disappeared.